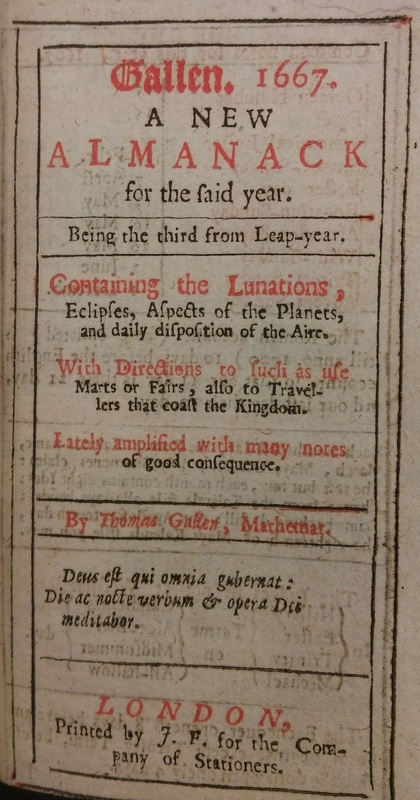 The library recently acquired a little Gallen almanac of 1667. 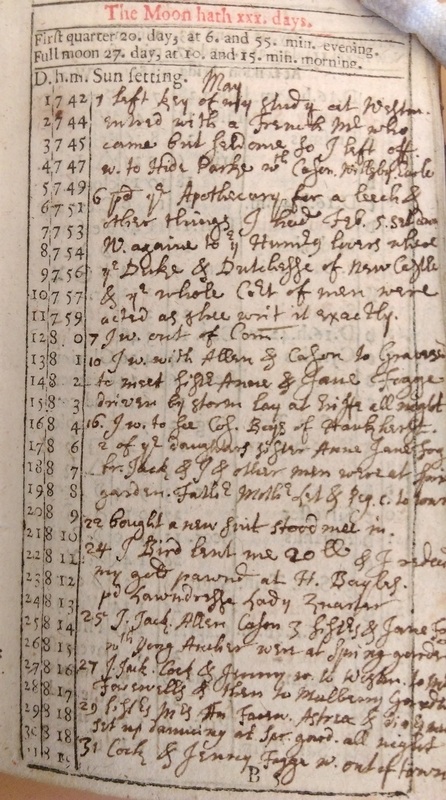 This work, itsel f a rare book (we have traced a handful of Gallen almanacs in the Bodleian, and none for 1667), has become a unique manuscript as it contains a diary of Jeffrey (or Jefferay) Boys of Betteshanger, Kent for the year 1667. The catalogue has just been published online. Although the diary covers only 12 pages (one per month), it is of considerable interest as a record of Restoration London. In the words of the bookseller Samuel Gedge, who identified the author and the significance of the diary, the diarist “offers a masterclass in Restoration dandyism: gambling, socialising, drinking, dancing and theatregoing”. Jeffrey Boys (1643-1703) was a young lawyer at Gray’s Inn, one of many sons of John Boys (d. 1678), possessor of the manor of Betteshanger in Kent. John Boys was married three times, and the numerous references to brothers, sisters and cousins in the diary refer to step-relatives and brothers and sisters-in-law as well as full siblings, and all can be traced in pedigrees of the Boys family and John Boys’s will held in the National Archives. Jeffrey’s mother and father make a brief appearance in the diary when ‘Father & Mother Let’ come to London. Jeffrey’s mother was named Letitia. The most extraordinary aspect of the diary however is Boys’s meetings with the female playwright Aphra Behn, with whom he is clearly acquainted. Aphra goes by the name of ‘Astrea’, and her identity might not have been established but for the fortunate discovery in 1930 of another Jeffrey Boys diary of 1671. Astrea was apparently a name Aphra Behn adopted when she was a spy in Antwerp. 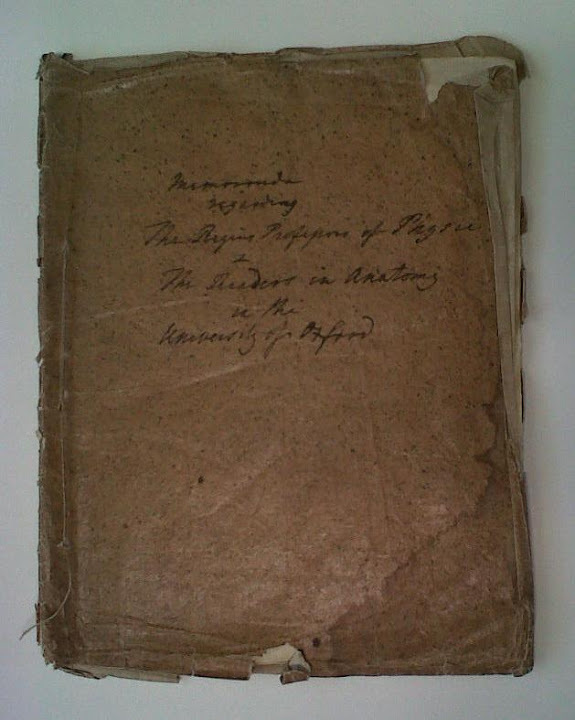 Sadly, the whereabouts of the original diary is not presently known, but the discoverer, though not recording where he saw it, wrote it up in Notes and Queries, noting that Boys records that he saw Astrea’s play the Forc’d Marriage, and then that ‘Astraea’s boy brought me her play the Amorous Prince’. The 1667 diary shows that Jeffrey Boys’s connection with Aphra Behn was more intimate, and went back further than could be discovered from the the 1671 diary. 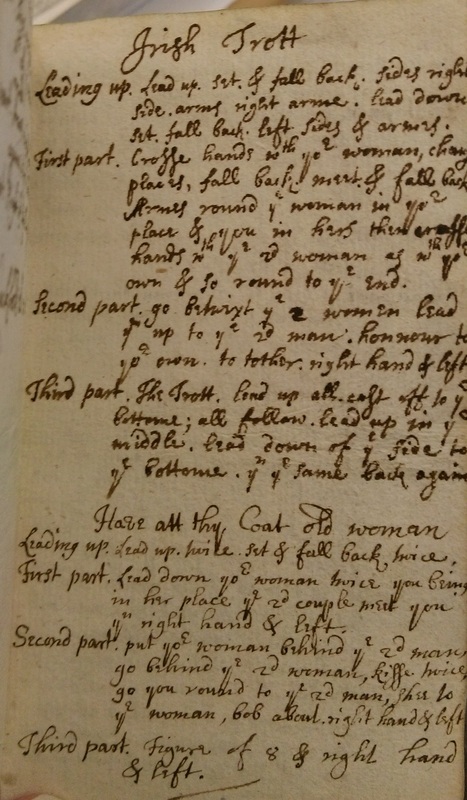 She makes her first of five appearances in Boys’s 1667 diary on 29 May when Boys, his sister, Astrea and ‘divers men set up dauncing at Spr[ing] gard[en] all night’. The date of this first entry is noteworthy because it is known from other sources that Aphra Behn had returned from her spying mission to Antwerp earlier that month (see her entry in the Dictionary of National Biography). It is clear from this entry that Boys already knew Astrea, and as she is treated in the same way as all his other friends and relatives mentioned in the diary, it is likely that they had known one another a long time. 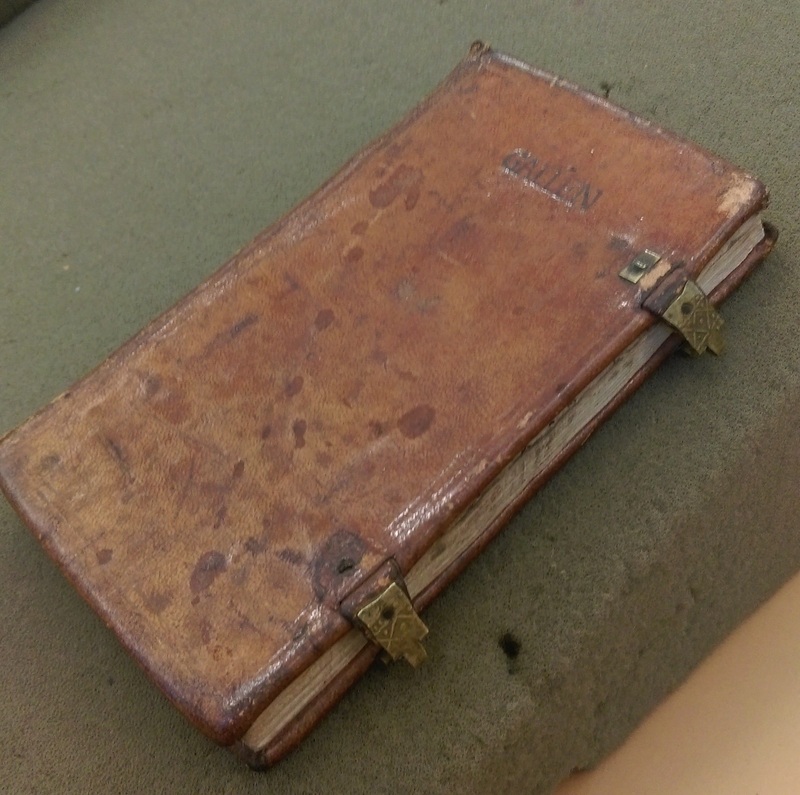 The diary has numerous interesting references to life in Restoration London. On 14-15 Jan 1667 Boys records attendance at various plays. He saw the ‘Indian Queen’ (‘it not having been acted in a long time’) and its companion the ‘Indian Emperor’ performed over two days, ‘the whole Court almost except th[ei]r Maj[est]ies being there’. This was Thomas Killigrew’s production, the man who was later to stage Behn’s plays and who was also connected with her spying activies. In February 1667 Boys helped to set up an Anatomy Club, missing its first meeting as he was watching Spanish rope dancers. At a later meeting he saw ‘a dog well anatomized’. November ….lost my cloake in Lincolns In field … bought new sword [he lost his old one]. had new Periwig. Boys also attended the ‘Humorous Lovers’ by the ‘Duchesse of Newcastle’ exactly, he says ‘as shee writ it’. It is supposed that the Duke of Newcastle actually wrote the play, but Pepys also saw it at the same time, and he too believed it to have been written by the Duchess. The diary gives an interesting picture of places of entertainment in post-Fire London. Several taverns are mentioned, the favourite being the Bacchus, where once again we find Boys and others dancing all night with Astrea in December 1667. In October Boys was up all night again, this time at ‘La Frouns’ (or possibly La Trouns – if anyone has information about this institution, please let us know). Among his companions on this occasion were ‘Ld Bellamounts daughters Lady Frances and Persiana’. Frances Bard, daughter of the Earl of Bellomont, was Prince Rupert’s mistress and mother of his natural son Dudley. According to some accounts, the relationship ended in 1667. At the end of the volume, Boys has copied out the steps for various country dances – perhaps he and Aphra Behn tried a few of them! A recent visitor to the Library with an interest in Lord Nelson and maritime history gave me an excuse to bring out some naval treasures. The Bodleian may not seem the most obvious place to look for Britain’s sea heritage, but there are a number of key collections nonetheless. The foundation as always is the extraordinary manuscript collection of Richard Rawlinson, which contains amongst much else more than thirty volumes of the papers of Samuel Pepys. Though famous for his diary, his role in life was naval administration. He rose to be Chief Secretary to the Admiralty under both Charles II and James II. 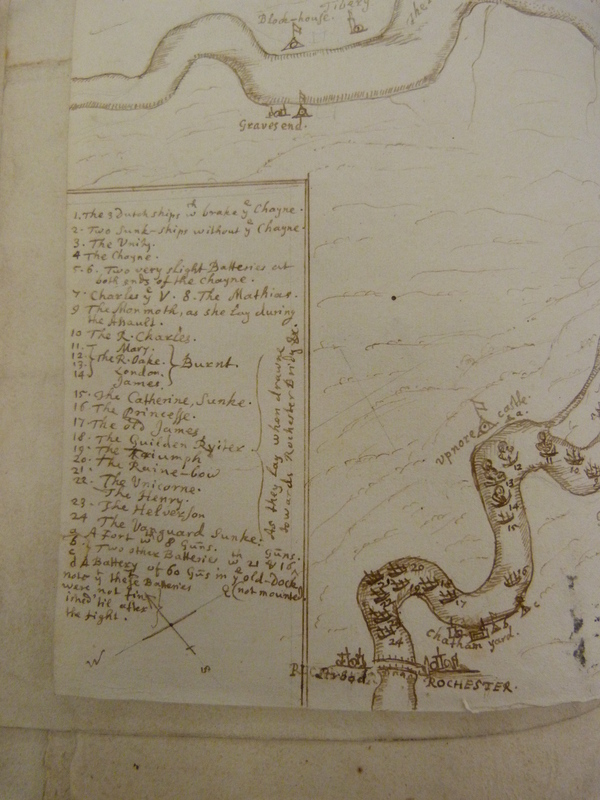 A key to the sketch explains the positions of the English ships and notes the burning of four ships in the Medway near Chatham Dockyard. The Royal Charles (10) was the flagship of the fleet, and the Dutch towed it away as a prize. 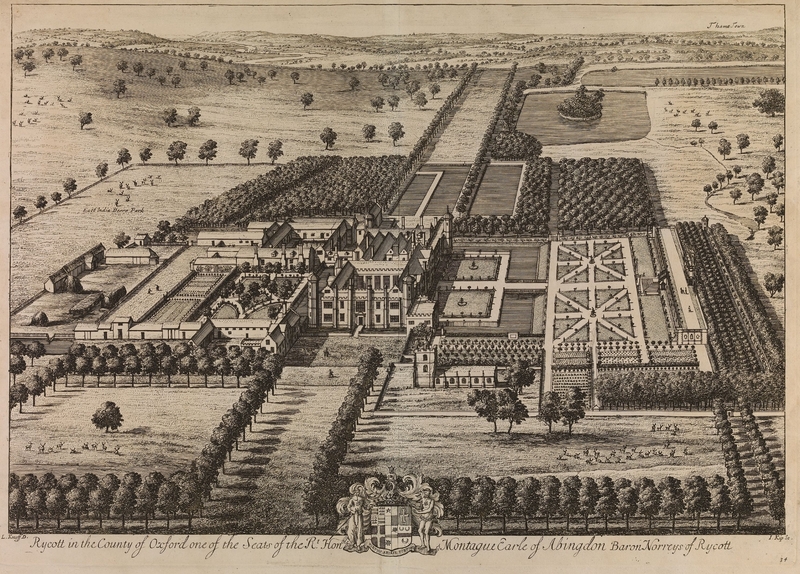 It had been the Naseby, but was renamed when it brought the king back to England at the Restoration in 1660. Pepys himself was on board that day. Her stern remains in the Netherlands to this day, kept in the Rijksmuseum. More about the Library’s 17th-century collections, or at least those acquired before 1922, can be found in an old but still useful guidebook, A student’s guide to the manuscripts relating to English history in the seventeenth century in the Bodleian Library (1922) by Godfrey Davis, now available online at the Internet Archive. The Bodleian continued to acquire naval and maritime papers, mainly through its modern political collections where the navy and shipping have often featured in policy, but also through accessions of family papers where there are sometimes naval connections even when the main subject is a literary or political figure. A search for the words ‘navy’ or ‘naval’ using the online search page for manuscripts returns hits on 92 collections. Among these are the papers of Pepys’s patron the Earl of Sandwich in the Carte collection (see the Carte Calendar); secret service papers of Sir Evan Nepean who was Secretary to the Admiralty from 1795 to 1804, catalogued among single items of historical papers; papers of the naval surgeon John Harness (?1755-1818) who became embroiled in a bitter dispute about lemons; papers of the Mary Somerville, which include correspondence of her father Admiral William George Fairfax (1739-1813); and papers of William Waldegrave Palmer, 2nd Earl of Selborne, First Lord of the Admiralty 1900-1905. Of course, Bodley was a son of an Exeter merchant, and his marriage to Ann Ball, widow of a Totnes merchant, is supposed to have given him access to her money derived from the pilchard trade. So the Library could be said to be built on England’s seafaring endeavours. 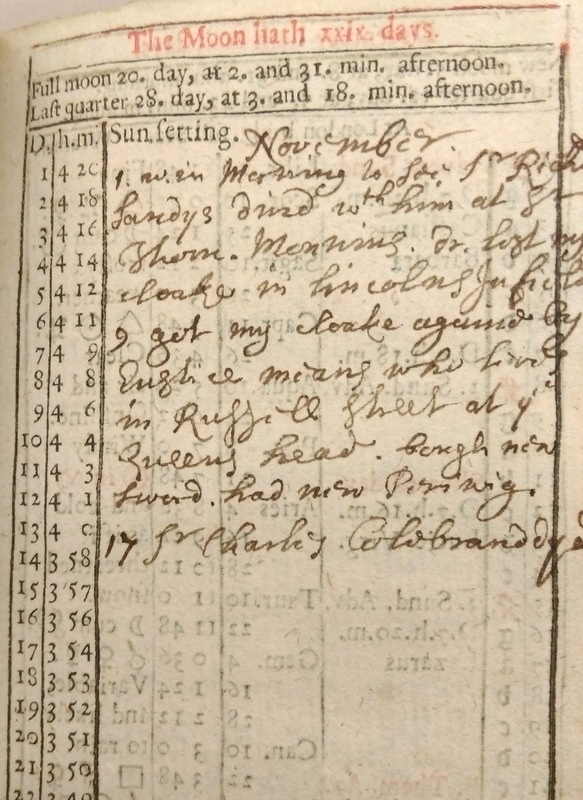 In this time of rain and flood it is interesting to see how an Oxfordshire clergyman recorded unusual weather in the 1630s. MS. Top. Oxon. 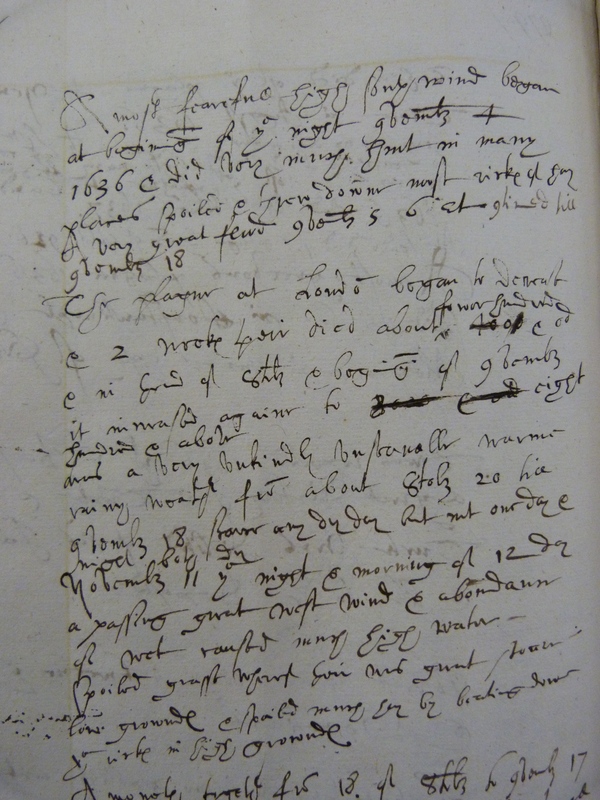 c. 378 is a diary of Thomas Wyatt, rector of Ducklington and vicar of Nuneham Courtenay. His manuscript volume began life as a chronicle of the kings of England, but the extraordinary events of the reign of Charles I caught up with him, and in the 1630s the volume becomes a diary recording contemporary happenings. Wyatt also records exceptional weather and its effects on farming and prices. These are taken from entries in 1635-7. It would be interesting to know if anyone can explain the rain of wheat, or if this phenomenon is recorded elsewhere. ‘In Decemb[er] 21  a pretty snow covered the grow[n]d wthout any drift lay wth hard frost about 7 dayes. A very ope[n] misty rainy January very warme wth 3 or 4 dayes small frost rest all ope[n] & a great flood. A most fearefull high south wind began at begin[n]ing of the night 9vemb[er] 4 1636 & did very much hurt in many places, spoiled & threw downe most rick[es] of hay. A very great flud 9ve[m]b[er] 5, 6 etc [con]tinued till 9vemb[er] 18. The plague at Londo[n] began to decrease & 2 week[es] their died about fower hundred & od & in thend of 8tob[er] & begi[n]ing of 9vemb[er] it increased againe to eight hundred & above. Twas a very unkindly unseanable [presumably unseasonable] warme rainy weath[er] fro[m] about 8tob[er] 20 till 9vemb[er] 18 scarce any dry day but not one day & night both dry. Novemb[er] 11 the night & morning of 12 day a passing great west wind & abondance of wet caused much high water – spoiled grasse wherof their was great stoare in low grownd[es] & spoiled much hay by beating downe the rick[es] in high grownd[es]. While on the subject of flooding, a few people have asked what the document is that forms the background to the Historical Archives and Manuscripts blog. 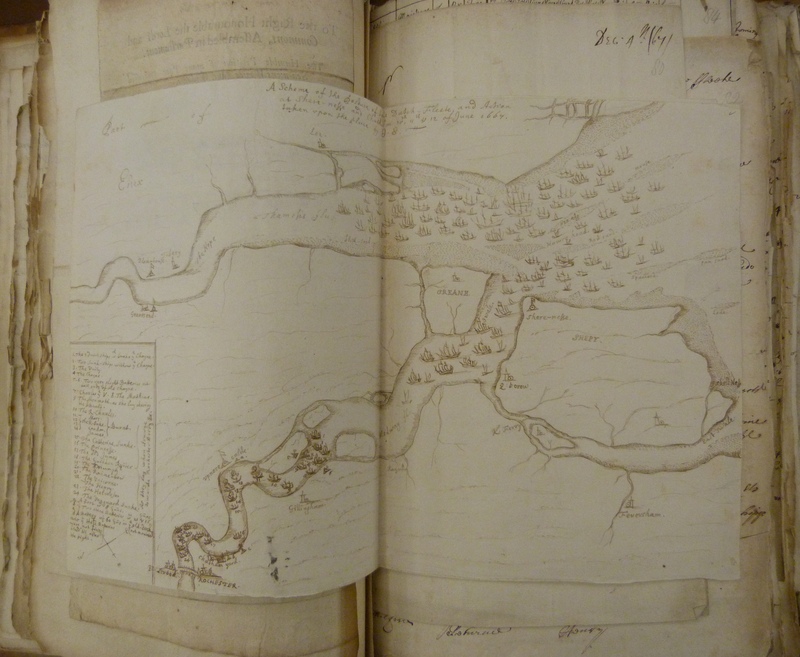 It is from a sketch of the battle of Sedgemoor 1685, MS. Ballard 48, fol 74. Sedgemoor is on the Somerset Levels, much in the news at present. The plan was photographed for the Rediscovering Rycote website. The earliest reference to a boiler? 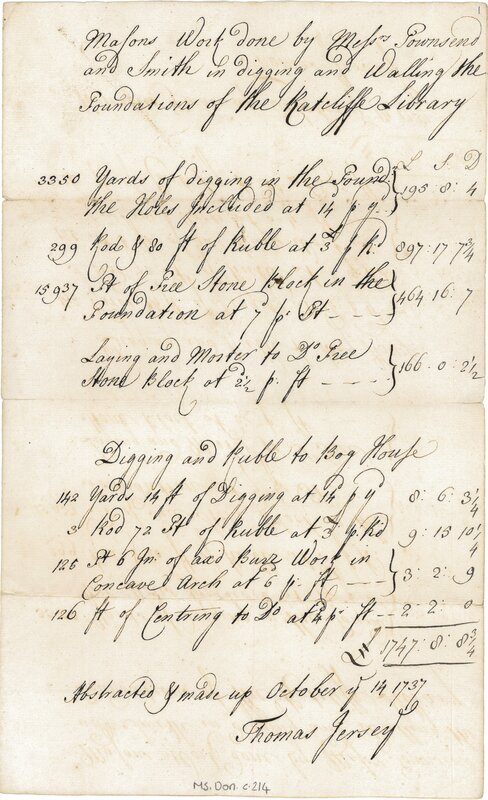 A ledger in the Townesend family archive contains a reference to a Robert Johnson being paid for six days work ‘laying sume stepts & hang the Boiler in the Kicthing’ at Christ Church. The Oxford English Dictionary defines a boiler as ‘a vessel in which water or any liquid is boiled’ and cites Daniel Defoe’s 1725 publication A New voyage round the world, by a course never sailed before as the first use of the word. The reference in the Townesend archive dates from February 1718 [new style]. Could this be the earliest reference to a boiler? In 2012 the Bodleian Library acquired a major new source for the study of the architectural history of Oxford. 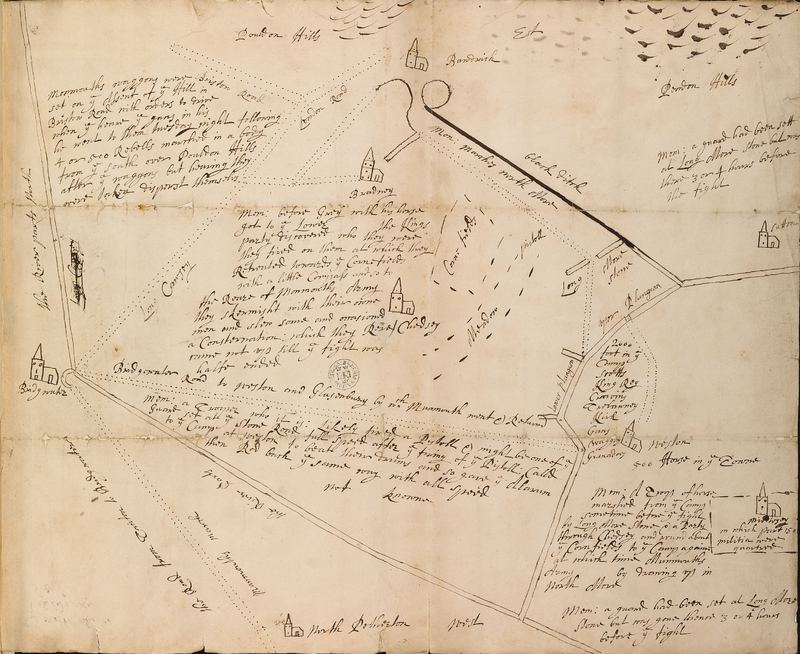 The Townesend archive documents the work of three generations of Oxford’s leading family of master-masons: John Townesend I (c.1648-1728), his son William Townesend (1676-1739), and his grandson John Townesend II (1709-1746). The archive was in private hands until its acquisition by the Bodleian and has only been seen twice by architectural historians, who did not make extensive use of it, since the 1920s. It is the only known archive of a major family of Georgian builders to have survived intact. The Townesends were responsible for much of Oxford’s architectural transformation between the late seventeenth century and the mid-eighteenth century. Work for the University and Oxford colleges formed the mainstay of the family’s business. 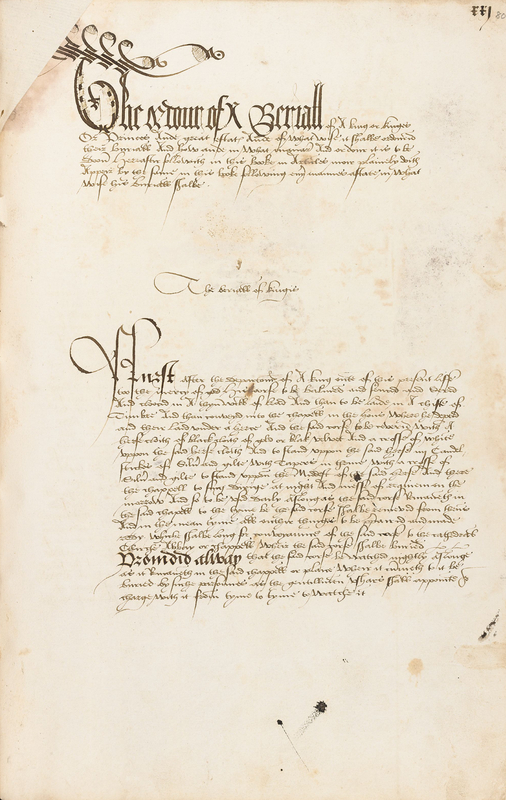 Work at nineteen Oxford colleges, ranging from major contracts such as the construction of Queen’s College Library to minor jobs such as repairs to chimneys, is documented in the archive. Other major University and college commissions recorded in the archive include the construction of Peckwater Quad at Christ Church, the Codrington Library at All Souls College; and the Radcliffe Library (Camera). The family’s work also extended beyond Oxford. The ledgers of John Townesend I record him supplying stone to St Paul’s Cathedral, 1687-1694, and Hampton Court Palace, 1689-1691, and his work at Blenheim Palace in 1706. His son William was commissioned by Allen Bathurst, 1st Earl Bathurst, to remodel Cirencester House, Gloucestershire, 1725-1726. Although the archive contains no architectural drawings, it offers a wealth of information concerning the costs and transportation of building materials, wage rates for labourers and stakes in quarries. The catalogue of the Townesend family archive is now available online. (MS. Eng. misc. b. 208, fol. 80). November seems to be the month for major episodes in the religious troubles of the early modern British Isles. The Accession of Elizabeth I in 1558, the attempt to blow up the King and his Parliament in 1605, the landing of William of Orange at Torbay in 1688 and Bonnie Prince Charlie’s invasion of England in 1745, all happened in November. 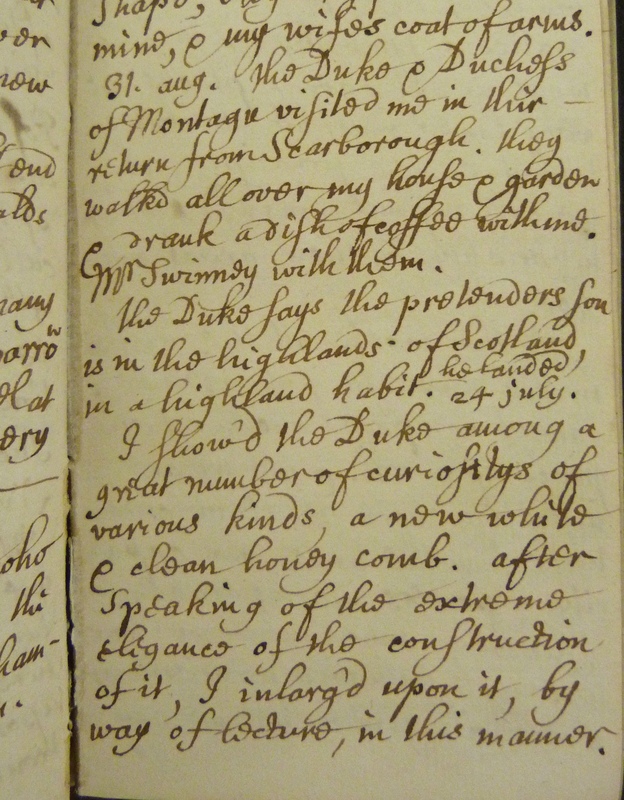 Looking at the entry for 30 August 1745 I found that Stukeley was visited on that day by his patrons the Duke and Duchess of Montagu, returning from Scarborough. He noted that the ‘Duke says the pretenders son is in the highlands of Scotland, in a highland habit’, before recounting his discussion with the Duke on the elegance of the structure of the honeycomb. ‘Lady Malton fled from her seat by Sheffield, came to Stamford, & alarm’d us, with the rebels being near Newark. Spalding, Wisbech, Peterborough, Oundle & all the country round in the utmost fright: hiding & carrying off their goods. This alarm was renew’d on 5th the rebels being at Derby & setting a guard on Swarston bridg, for Leicester. Many familys mov’d off their goods, & remov’d towards the fen country, & an universal dejection. This would have been Samuel Gale (1682–1754) the antiquary, and Stukeley’s friend, whose family seat was Scruton Hall in Yorkshire. ‘½ an hour after 11 in the morning, pleasant and sun-shining frost: the Duke of Cumberland came hither [back from Carlisle] … He rode in Mr Midlemores coach from Grantham, thro’ the badness of the Scogate road … & took coach at the Bull. Mr Gale lent him his coach & 4. They put 2 more horses to it. His R. Highness was drest in blew. He has not been in bed, since he set out from Carlisle. Our town complimented his R.H. with a vast throng & loud huzza’s & bells ringing etc. The first doleful effects of the rebellion also touched Stamford when on 1 February 1746 ‘the rebel prisoners of the garrison of Carlisle passd thro’ Stamford in 4 open wagons, guarded by 400 soldiers, & the same day the Dukes mules with his baggage came hither, going to Scotland.’ The Battle of Culloden was fought on 16 April 1746; some of the Jacobite officers captured after the fall of Carlisle in December 1745 were sent to London to be hung, drawn and quartered for High Treason. I should, of course, have expected to find such echoes of the ’45 in Stukeley’s diary. Stamford lay on the Great North Road from London to Edinburgh (now the A1). On the 1st June 1807 an extraordinary auction began at Rycote Park, near Thame in Oxfordshire. Over the course of the next three days, Rycote’s grand Tudor mansion was sold off brick by brick and demolished to help pay family debts. All that survives today is a fragment of the south-west tower. It was an inglorious end for a house which had once been the dominant force in Oxfordshire politics and entertained kings and queens. Henry VIII visited with his new bride Katherine Howard in 1540. The young Elizabeth I was entertained at Rycote en route to her incarceration at Woodstock in 1554, and she returned on four occasions during her reign. Charles I and his court were accommodated in 1625 when the first parliament of his reign was reconvened in Oxford due to an outbreak of the plague in London. Rycote’s regional and national importance, however, has long been neglected. Not only was the mansion demolished in 1807, but perhaps more importantly, the main bulk of its archive was thrown on to a bonfire. A Bodleian Libraries project has helped to reveal and shed new light on Rycote’s past. The Rediscovering Rycote website brings the voices and stories of Rycote back to life through manuscripts, letters, maps, accounts and drawings brought together in digital form from more than fifty different Bodleian collections. The website also explores the lives of Rycote’s owning families, generations of whom played active roles in political, military and cultural circles. A range of digitised resources explore their involvement in areas such as Henry VIII’s suppression of the monasteries; Elizabethan warfare; the politics of the Restored Stuart monarchy; and the London music scene in the eighteenth century. Visit the Rediscovering Rycote website to find out more. Henry VIII founded the post of the Regius Professor of Physick (Medicine) at Oxford towards the end of his reign. A new item purchased by the library in 2010, the ‘Memoranda regarding the Regius Professors of Physick & the Readers in Anatomy in the University of Oxford’, lists and describes each post-holder from the first one in 1535 to 1792, when the memoranda was updated. This small manuscript notebook makes fascinating reading. Its original author is unknown but internal evidence suggests that it was written in the 1770s and then annotated by the antiquarian and Registrar of Oxford University, John Gutch, in 1794. The Regius Professor of Physick and the Reader in Anatomy were often the same person, and sometimes posts were passed down from father to son. The 7th Regius Professor, Thomas Clayton, is described as, ‘the Son of the first Reader, & the Office devolv’d upon him as Regius Professor: but being averse to the sight of a dead Body / Wood says of a timorous & effeminate Humour / he employ’d William Petty as his Deputy in whose Favor he resign’d the Readership in January 1650’. Since the foundation of the post there have been 30 Regius Professors of Medicine at Oxford, the current one being John Irving Bell, the immunologist and geneticist. Saving Oxford Medicine has been tracing the archives of all the 20th Century Regius Professors and the results have been published on our website. When archivists receive a collection one of the first things they’ll need to do is identify any digital material. However it won’t be enough to single out for instance all the floppy disks or the CDs – there are subtler distinctions that need to be made. Archivists might not be aware of all these distinctions (or might need reminding) so I’ve been writing a media recognition guide to help archivists determine the specific types of data storage device they may come across. I thought I’d share some of this work with you and first up we have: Floppy Disks. Floppy disks come in four sizes. 8” and 5.25” disks are encased in bendable plastic, 3.5” disks (which are actually 90 x 94mm) are encased in rigid plastic and have sliding metal shutters and 3” disks also come in rigid plastic which is harder than the 3.5” covering and are thicker than the other disk. Single Density (SD) – First type of floppy disk available. Double Density (DD) – On average twice as many bits per time unit can be encoded compared to data on a single density disk, thereby doubling the capacity. Quad Density (QD) – Holds four times as much data as a single density disk. Not all sizes of disk are compatible with the different densities, which is important to know when identifying the disk type. There are two ways in which data is written to a floppy disk. The tracks on floppy disks are smaller on the inside of the disk than on the outside, therefore when writing data the disk can either maintain a constant speed in terms of the time taken for the disk to rotate 360 degrees or in terms of the time taken to cross each track. Constant Angular Velocity (CAV) maintains a constant rotation speed whereas Constant Linear Velocity (CLV) ensures that each track is crossed at the same speed. CAV is used by most microcomputer platforms, such as IBM PC, Amstrad CPC and Microsoft Windows, but Apple adopted CLV. This method is more efficient, thus explaining why Apple disks have larger capacities. However, CLV requires a special mechanism, which renders Apple floppy disks incompatible with other computers. Apple eventually abandoned this method and adopted the CAV standard. Quickly declined in popularity after the 5.25” disk was introduced and by 1978 most manufacturers had adopted 5.25” disk drives. Contemporary machines had inbuilt floppy drives. Drives can be externally attached to modern computers. Almost universal during the height of their popularity in the 1970s: was one of only a few affordable mass storage devices available. Used by individuals and small organisations for data storage and backup and by manufacturers for booting software. The 8 inch floppy was the first disk to be introduced in 1971. Like the other disk sizes, 8 inch floppy disks consist of a disk with a central hole encased in a plastic envelope. The easiest way to identify the low level format of an 8” floppy disk is by any labelling on the disk. The majority of manufacturers brand the disk as double density if that is what it is. The format ‘Single Sided’ was not coined until Double Sided was invented in 1976, therefore early SS disks will not be labelled as such. However, this does not mean all unspecified disks are single sided. Likewise it is difficult to determine the density of a disk if this is not labelled, although the capacity of the disk is a good indicator. The first read-write 8” floppy drives were introduced in 1972 with a capacity of 175 KB. In 1973 IBM released its own floppy disk drive which used a different recording format thereby increasing the capacity to 250 KB. This became known as Single Sided Single Density (SSSD) and drives supporting SSSD were soon being made by several manufacturers. 8” floppy disk drives were the storage device of choice used by the first ‘microcomputer’ operating system in the 1970s. Double sided drives were first introduced by Burroughs Corporation in 1975 with a 1 MB capacity.